In my previous reviews, I’ve mentioned trying to branch out into new genres this year. Besides expanding your mind, one great bonus about exploring new sections of the bookstore is that all of the genre’s classics are new to you. That’s how I felt about about reading The Final Empire, the first book in Sanderson’s much-lauded Mistborn trilogy. The book is nearly fifteen years old, but hot off the presses for me. After finishing the first book, I’m looking forward to spending more time in this world and finishing up the trilogy. 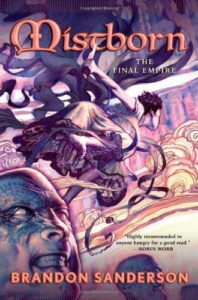 A bit about Sanderson’s world building: If “The Final Empire” sounds like an intimidating place to live that’s because it is. A “Final” anything is big trouble, because you’re necessarily out of options. And, any nerd knows better than to trust an “Empire”. That’s the situation the citizens of “The Final Empire” find themselves in. They’re living in a static society led by the millenium-old “Lord Ruler”. The Empire is covered in literal ash, which drifts down like rain. At night, mysterious mists cover the earth. That’s the world. The upper class nobles live in relative comfort and pretend like the world isn’t broken, and the “skaa” class of servants and slaves are too busy trying to survive to worry about changing their status. The only downside to this book is that it’s about 550 pages, so I was coming up against the library due date while trying to finish the last 100 pages. If you like to read at a leisurely pay in your leisure time, I would say that you take a leap of faith and invest in the pretty hardcover, or get the Kindle version so you can take your time. I’m reading this at the moment, about halfway in. I just read his latest book, Skyward, which is amazing. I loved it so much I decided to check out some of Sanderson’s other work. I’m struggling a bit with Mistborn as I only have time to read in 15 minute snatches during the day, so finding it hard to get into. I’m going to keep going though! I think all of the ground work in the front half really pays off in the back half!